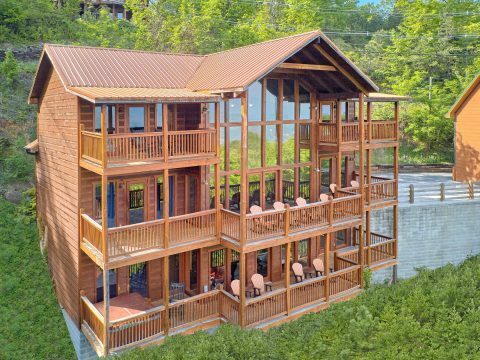 Gatlinburg Cabin With A View | "A View From Above"
Welcome to "A View From Above," a premium 5 bedroom cabins with room for 12 guests in the mountains above Gatlinburg, TN! 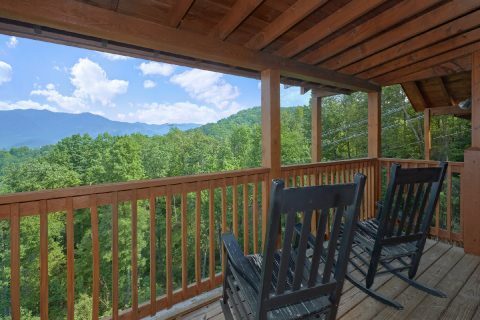 This rental boasts incredible mountain views year-round that you can enjoy from a rocking chair or the warm waters of the hot tub. 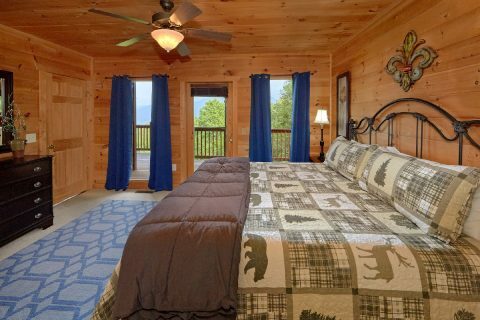 During the day, you'll love the sight of Mt. 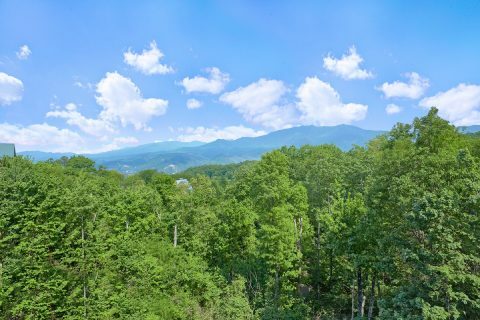 LeConte rising up in the distance, while at night; you can take in the dazzling sight of stars in the Smoky Mountain sky. 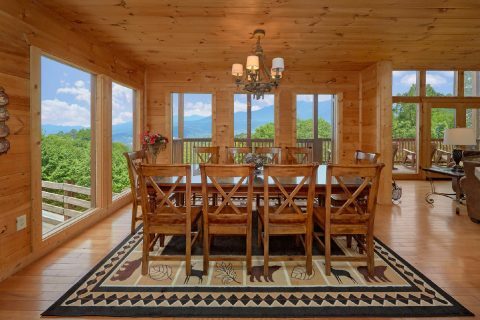 This cabin's view also looks over the tram that leads up to Ober Ski Mountain, so you can wave to skiers as they make their way to the slopes. 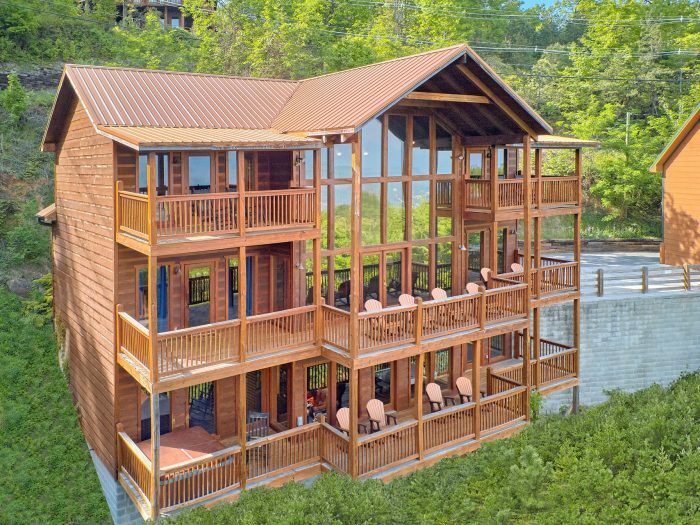 "A View From Above" is also only a couple of miles away from Ober Gatlinburg, so you won't have to travel far for skiing, snowboarding, ice skating, and snow tubing. 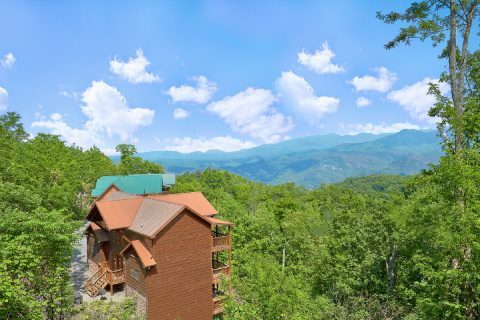 The charming town of Gatlinburg is also only 3 miles away from this rental in the mountains, so it's easy to explore popular local sights like Ripley's Aquarium of the Smokies and the Gatlinburg Space Needle. 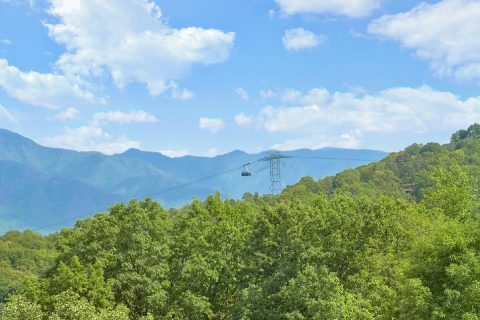 Popular destinations in the national park like Laurel Falls, the Chimney Tops, and Newfound Gap are also within easy reach from your cabin. 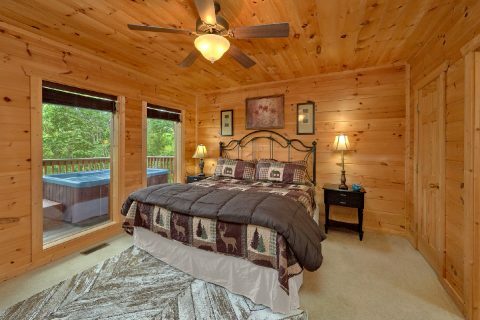 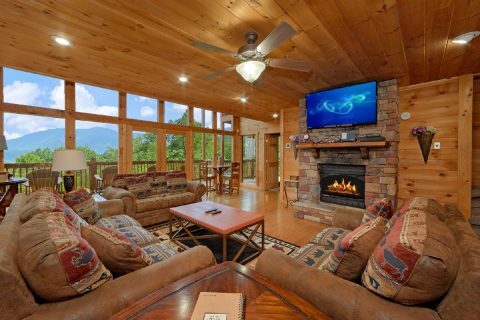 After a fantastic day spent exploring the Smokies with your family and friends, you'll love retiring to this cabin for some rest and relaxation. 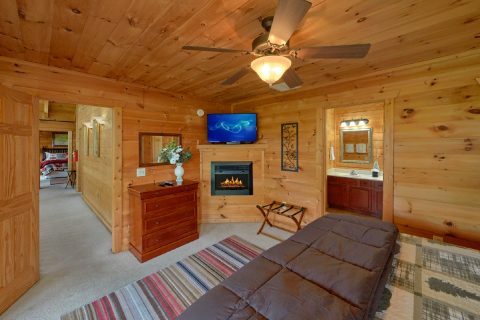 In the main living area, everyone will love gathering around the luxurious, stone gas fireplace with a flat-screen television in the spacious living area. 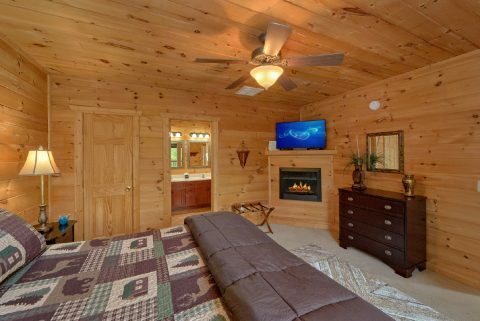 This level of your cabin features large picture windows throughout, so it's ideal for appreciating the gorgeous mountain scenery. 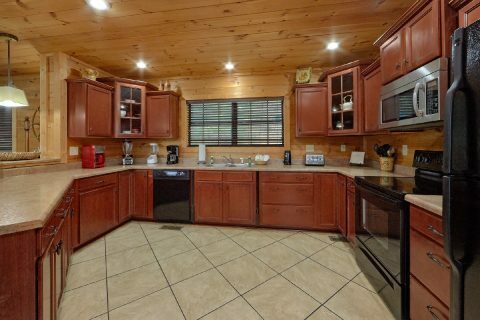 Nearby, the full kitchen ensures you can save your vacation dollars by preparing tasty meals in your cabin rather than dining out in town. 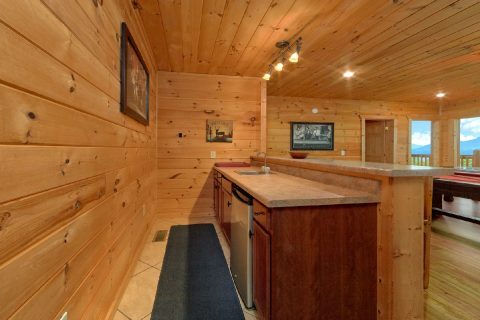 A gas grill comes provided if you'd like to host a cookout in the summer months! 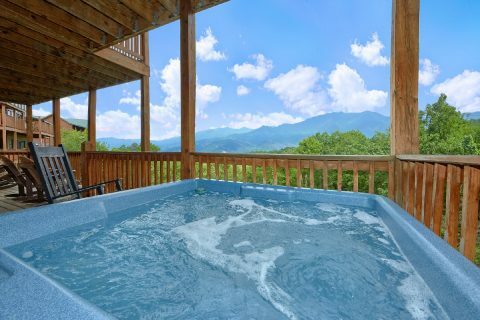 Additionally, this rental offers seasonal swimming pool access through its resort community. 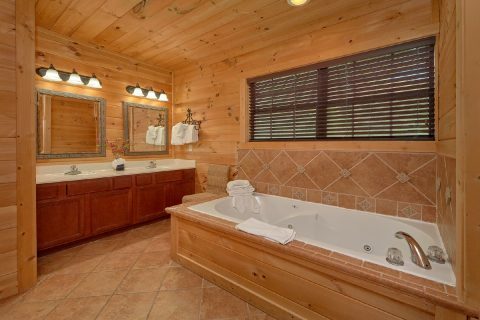 For a relaxing soak in private, you can always enjoy the warm waters of your cabin's hot tub or jacuzzi tub. 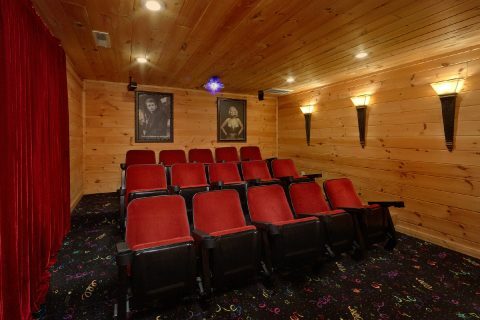 For watching your favorite movies and shows in style, this cabin comes complete with a luxurious theater room with theater-style seats, a surround sound system, and a 4K 75" television that can be used to stream movies and shows from online. 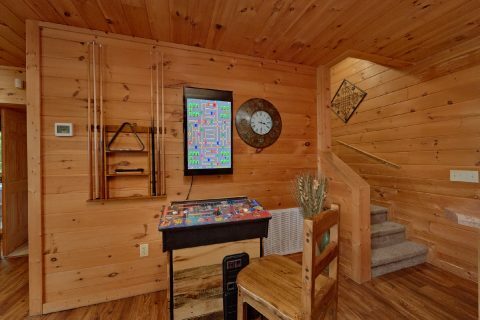 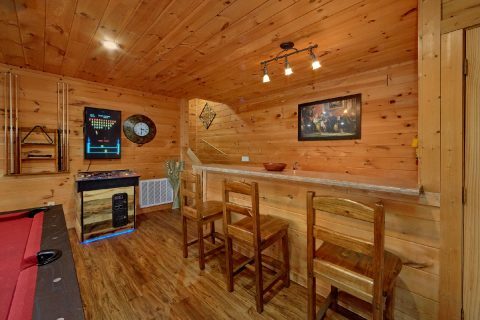 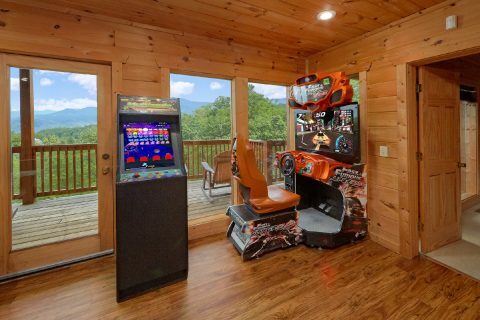 If the kids need to work off some energy, they can have a ball in the game room with a pool table, a Fast and Furious Race Car game, a multi-cade arcade game, a full-size refrigerator, and air hockey table. 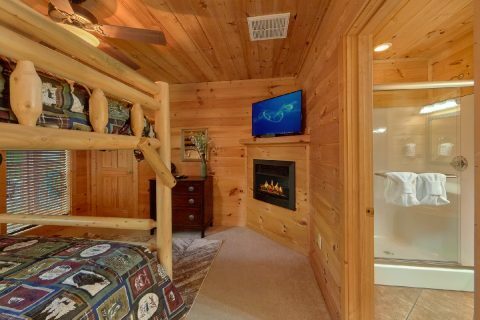 Once you're ready to get some sleep, this cabin offers 1 bedroom with a set of queen bunk beds and 4 king-size bedrooms with flat-screen televisions to sleep up to 12 guests in comfort. 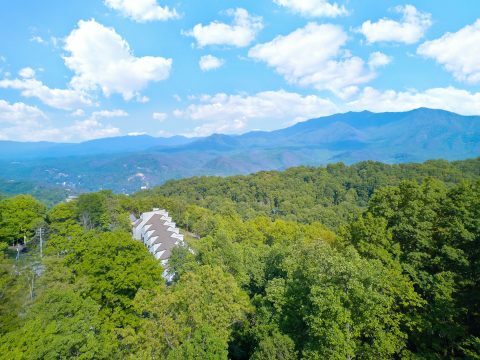 Lastly, "A View From Above" also offers practical amenities like WiFi Internet and a washer & dryer for guests to use. 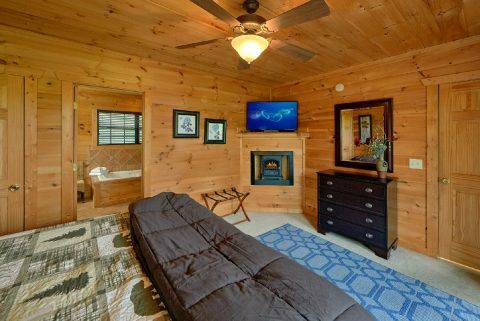 Need more space for more guests? 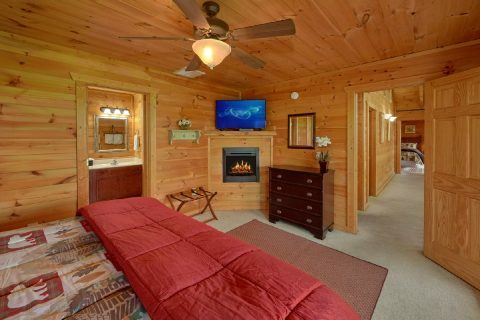 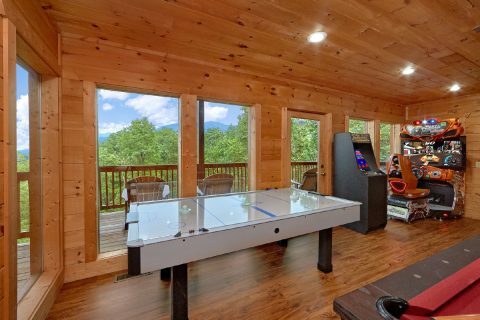 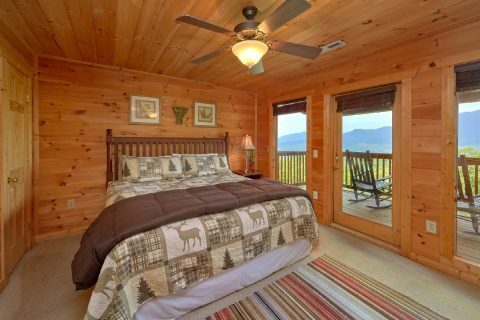 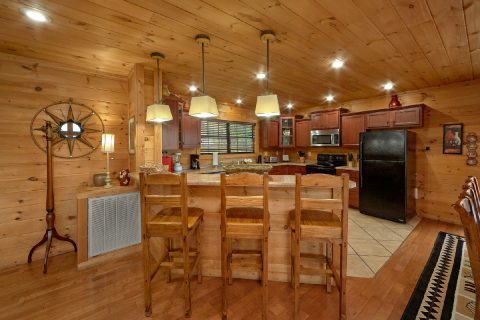 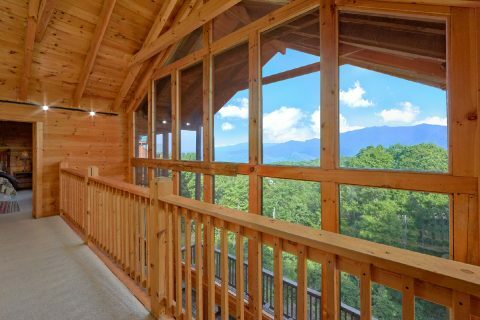 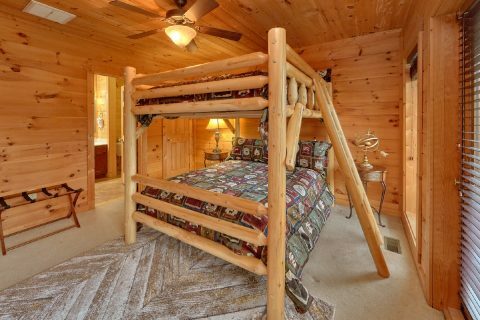 This rental rests close to "A Spectacular View To Remember," another 5 bedroom cabin in Gatlinburg if you'd like to reserve several beautiful cabins for your Smoky Mountain getaway! 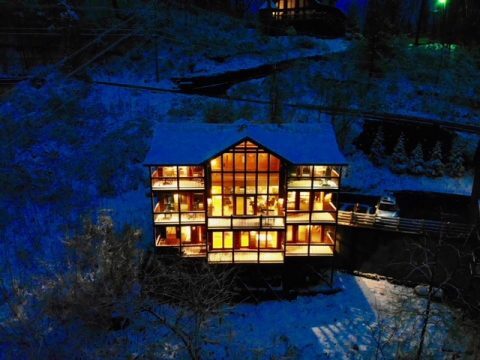 If you're looking for a cabin that truly has it all, consider booking "A View From Above." 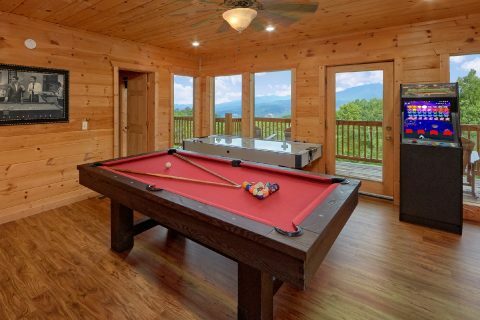 With this cabin's incredible mountain scenery, prime location, and luxurious amenities, you're bound to have a Smoky Mountain adventure you won't soon forget! 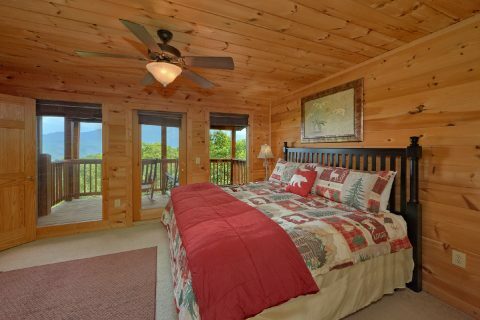 Book this rental online today to save 15% on your nightly rate with Cabins USA Gatlinburg!